This year's Able Flight scholarship recipients include an Army Lt. Colonel wounded in combat, four other veterans disabled due to accidents, and two women. 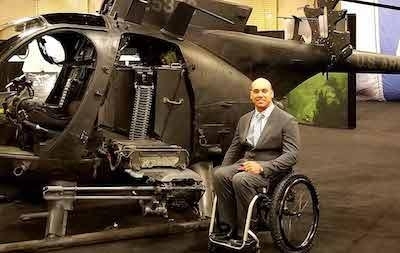 One of the veterans is a former Army helicopter pilot who is now paralyzed and will be returning to flying as a fixed-wing pilot with his Able Flight Scholarship. Receiving scholarships are Lt. Colonel Daniel Gade (US Army-retired) of Virginia (pictured), Leslie Irby and Ignacio Montoya of Georgia, Will Bucher of North Carolina (pictured, below), Samuel Mahoney and Steven Martinez (U.S. Marines-retired) of Wisconsin, T’angelo Magee of New Jersey (U.S. Army-retired), Anthony Radetic of Alabama (U.S Army-retired), Joseph Moncalieri of Massachusetts (U.S. Coast Guard), and Emily Hupe of California who is returning to train this year after illness forced a delay in 2018. 2019 also marks the tenth consecutive year of Able Flight’s partnership with Purdue University, and the third year of its partnership with The Ohio State University. With flight school beginning in mid-May, the students have already begun their studies with online courses donated by Sporty’s Pilot Shop. Graduates of the “Class of 2019” will be guests of honor when they receive their Able Flight Wings on stage at EAA AirVenture in July, just weeks after becoming licensed pilots.